The Republic of the Fiji Military Forces is well ahead of schedule with the construction of the new Rotuma Hospital. Chief of Staff Operations, Major Lepani Damuni says work on the $8.3million dollar hospital is expected to be completed this year. "The work has I've been informed by the engineers is on schedule, its 38 percent complete and is supposed to be completed by the end of November this year." Major Damuni says work on the new hospital began September last year and is currently in the second phase. The second phase includes the construction of the Northern wing, Southern wing and a double storey central block. Meanwhile the first phase of the project which includes the construction of the hospital kitchen and the mortuary has been completed. The MV Brianna will take rations for the 40 Republic of Fiji Military Forces (RFMF) engineers building the new Rotuma hospital at Ahau. This was confirmed by RFMF Engineers Corps operations officer Major Sanaila Vitukalulu. He said the barge that was supposed to transport the building materials for the hospital would leave on a later date. "The barge is being used at the moment for Tropical Cyclone Keni rehabilitation work," he said. According to Major Vitukalulu, the construction of the new Rotuma hospital is on track and is scheduled to be completed by September 2018. The total cost of the construction is around $8.3 million. He said the engineers were also working on three community projects on the island – a bakery at Hapmak Village, a piggery at Lopta and laying blocks at Lau village. Major Vitukalulu said the RFMF engineers team split into three groups on Saturdays to work on these projects. The people of Rotuma can expect a $13 million extended and sealed airport runway by the end of next month. According to Airports Fiji Limited (AFL) Co-head of Operations Air Traffic Management Amit Singh the project is a game changer for Rotumans. He said previously Rotumans had to make do with Twin Otter aircraft going into the island with a restriction of only five passengers per flight. "If anyone has had family going to Rotuma the waiting time to get on board and come out from Rotuma is very restrictive," Mr Singh said. "Some people wait for two months. With the Fiji Link ATR 72 going in it is a game changer allowing about 50 to 60 passengers to go in." He said overall costs would reduce if there was more demand, "so the ticket price will effectively come down". He said greater accessibility to the islands was their general vision since AFL took over island operations. "That is the general philosophy that AFL is trying to improve outer island airports also apart from the Nausori and Nadi International Airports," Mr Singh said. He stressed that it was not a business case for AFL, but a social obligation for the Fijian people. Mr Singh said their main profit centre was Nadi International Airport. The Rotuman project was a work-in-progress case for the past 30 years. 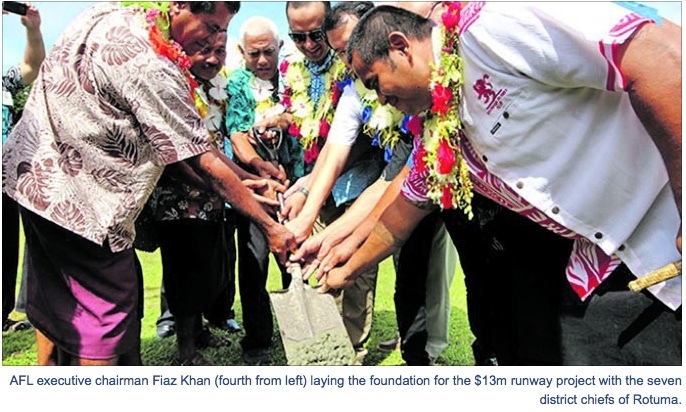 Once completed, the runway will be able to accommodate ATR 72 and ATR 42 twin-engine aircraft. For the project, $2.3 million was given in grants by the Government and the balance of $10.7 million was contributed by AFL as a Government-owned entity. The project was awarded to China Railway No.5 Engineering Group and provided employment opportunities for people on the island. The airport is located near Else'e Village in the district of Malhaha with a total of four staff looking after operations on the island. Mr Singh highlighted that AFL planned to develop most outer island airports within the next seven years. THE Legal Aid Commission will open new offices in Vunidawa, Keiyasi, Seaqaqa, Kadavu and Rotuma. Acting director Shahin Ali said this was possible through funding allocated to the Legal Aid Commission this year. In the 2017/2018 national Budget, $8.4 million was allocated to the commission. "It has been put to good use and that is by opening offices around the country, expanding our services and outreach to the people of Fiji and by providing employment for many graduates," he said. "While global standards and international best practices focus on Legal Aid for criminal matters only, we have taken it a step further by applying these practices for civil law matters as well as other forms of legal services. We have made legal services readily and easily accessible, including rural and remote areas as well as islands. "Our lawyers go to places where no other lawyer would go. "We take our services to the people who cannot come to us," he said..
"There are times when we have visited clients and members of the public at their residence or in hospitals because they are not able to make it to our office due to reasons of old age, ill-health or they have difficulty with mobility or are bed-ridden,"